January 25-27, 2019, Houston. — The Houston-based National Parrot Rescue and Parrot Foundation (NPRPF) hosted its celebratory 20th Annual Parrot Festival this past weekend, drawing attendance from across North America. “Queen” Georgia Hayes, NPRPF President, and Danny Sigmon, Festival Coordinator, presided over a Convention center decked in colorful tables covered in bird chachki, raffle-ticket drums, and auction items. Perches, aviaries and companion parrot homebases (aka “cages”); bird toys for foraging, gnawing, preening, cracking in two with keratin clamps; festooned ceilings, feathered jewelry and the almighty Red Feather Hat, destined to steal the show at the banquet! Nonprofits and NGOs from sanctuaries and conservation/recovery programs to the new Seattle Flight Club rounded out the fun. All brightness was but backdrop before the camaraderie of the bird folk who flocked. . . Ahem, and, yes, the banquet room did host heavily scheduled lectures by experts which intrigued, entranced and challenged this unduly joyous, good-humoured crowd. Alongside presentations from such notables as anthrozoologist Pat Anderson and AFA leader/seasoned aviculturist Steve Duncan, four experts presented four endangered species: Jafet Velez (Puerto Rican Parrot), Bennett Hennessey (Blue-throated macaw), Dr. Caroline Efstathion-Horsburg (Red Siskin Initiative), and David Skidmore (Eclectus Parrot). Perhaps most delightfully, budding scientist Andrea Celeste Velez, Jafet’s daughter, who begins medical school in the fall, presented her first academic paper on Determination of the Normal Blood Chemistry Values for the Puerto Rican Parrot. — Aviculture is family is friends is lifestyle! BirbObserver fell behind on its intended January schedule — yet the drive to write more articles surged out of the woodwork in Houston. . . BirbObserver in coming days shall debut a new page: ConSAv, for conservation and aviculture articles. 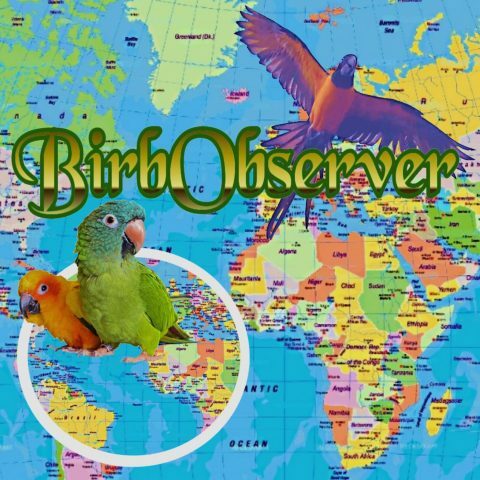 Accordingly, over the next few weeks we hope to bring you not only Gen(i)us articles on the Golden Conure and Toco Toucan still outstanding but also articles on ConSAv regarding the reintroduction of Puerto Rican Parrots, the Flagship blue-throated macaws at Armonia’s Barba Arzu Reserve, and the Red Siskin Initiative. Below we share the posters from the Blue-throated macaw exhibit at the Festival — open to the public. Thanks and appreciation to Mithoo (Instagram @mithoo_indianringneck) for alerting us to this! Kite fighting is an ancient sport, long practiced in cultures across the globe, from India, Japan, Chile, Afghanistan, Nepal to Brazil. Kite string typically is coated with a mix of glue and powdered glass, then used in kite “dogfights” in which the winner successfully cuts the other kite’s string. This string is variously known as manja, cerol, or hilo curado among other terms. But in regions where kite fighting is popular, the string has proven lethal beyond the kite-fighting environment. The photo of a parrot suspended between branches, snared around the throat and slowly strangled by sharp-sharded string , reproduced in this India Today article, was shared by Twitter user @biditabag. The tweet went viral, tearing at heartstrings worldwide. Imagine an aerial gill net coated with powdered glass! Fighting-kite competitions — including Ahmedabad’s International Kite Festival — are part of Makar Sankranti (better known in the West as Kumbh Mela), a winter solstice celebration thousands of years old. This year’s celebrations concluded January 15. Unfortunately, at least one gorgeous parrot won’t be there to enjoy next year’s. These contests are also popular on August 15, India’s Independence Day, and two years ago a Delhi animal hospital was inundated with 500+ injured birds due to manja. This year’s Makar Sankranti toll included 70+ birds admitted for treatment in Mumbai alone. Manja string injuries are hardly limited to birds, alas. That same Independence Day two toddlers and a 22-year-old lost their lives when kite string slashed their throats. In February and October of 2018, a similar fate befell two women in Pune. In Pakistan last year, two died with cut throats within a week in March (one victim a mere child), another in September. All were caught while traveling on scooters or with their heads outside the protection of their cars. And just three days ago, a Mumbai engineer crashed his motorcycle and died trying to avoid the dreaded string. The guilt lies not with specific cultures or governments, for both India and Pakistan have banned, except when used in tightly controlled, sanctioned contests. The similar history of injuries and deaths due to illegal fireworks use in the United States bears witness to the real culprits: thoughtlessness and carelessness. No society is entirely free of this kind of behavior. But it’s not right that our avian companions should also suffer because of our human shortcomings. We as a community would do well to promote manja bans where none exist, and advocate for rigorous enforcement in location that have already banned manja. Congrats to our 1st Annual Birbie Award winners! MOST INSPIRING: Facebook: (Dramatic Pause): The wonderful Welsh-speaking, parrot-parronting Joan Rakrhra of Joan’s North Wales Parrot Rescue! It’s not that Goldie stars in a British TV series, nor that Rolo was brought back from the dead and severe plucking mania, it’s that she makes the best chop and creates such a loving circle of supportive parronts around the rescue. Instagram: Previously announced but no less marvelous, Parront to ten birds, of whom nine are rehomers/special needs, the fabulous Birds of a Feather, @Bird_tails! With a warmth and wisdom unusual for her age and for her years in foster care, Tango’s parront shares her passionate love of birds in an irresistible way as her followers journey alongside her. We’ll tell you more about Birds of a Feather and each of our winners in our upcoming TheRoundUp, January 19. BEST TRAINER: Facebook: (Dramatic Pause): The always inquisitive, always innovative-with-technology nice guy, Chris Armstrong, free-flight enthusiast and accomplished animal trainer at Flying Colors Aviary, seemed enthusiastically to concede to Lara Joseph on first learning she was the other nominee: “SHE IS THE BEST!” By final vote, Lara, owner of The Animal Behavior Center, did prevail. Lara uses positive reinforcement and Applied Behavior Analysis (ABA) to improve the quality of care of pets and also the quality of relationships they have with their owners. A member of the Indonesia Parrot Project Advisory Board and consultant to zoos, shelters and countless parronts, Lara travels internationally from her base in OH to lecture, teach and demonstrate. Instagram: Previously announced but as delightful, entertaining and genuine as ever, young phenom, Canada’s Cleverest Bird, @Koa_tiko! Amazingly, Koa’s mom trains him intuitively, treating Koa as a child, ensuring lots of sleep and making training just part of enrichment and playtime. She has never received formal training! BEST AVICULTURIST: Overall: Standing so much in a class of his own as author of the globally treasured classic, Psittaculture, that no other nominations were received, our phenomenal winner, Facebook’s Tony Silva: a Miami resident, Tony learned the best of aviculture on his many travels and in the 1990s served as Curator at the beloved Loro Parque in the Canary Islands. Tony Silva’s award-winning compendium on Aviculture, Psittaculture, has been translated into over ten languages and now has published in a second edition! CITIZENSHIP AWARD: We elaborate a preface prior to announcing the award which is most precious to BirbObserver, The Citizenship Award. BirbObserver particularly esteems this award, as the ezine seeks to serve the diverse online bird communities. As we all know, life online can let loose the unruly and rude at times. Thus, those who bring civilizing graces to bear deserve gratitude and recognition. It goes without saying that countless deserving persons were not even nominated, and that in our first year, we may not ourselves have best formulated our awards system. But we have done our best. We hope these awards encourage you throughout the year to thank those who demonstrate excellence in building our communal life. This first year has proved an inspiring learning experience. Importantly, the candidates you nominated exceeded our expectations, and we may expand our categories in coming years. Life is a journey end-to-end with learning moments so we appreciate your help in making these awards the best possible into the future. Facebook’s Adventures of Roku (FB), Brisbane’s online organic bird food shop which cultivates avian — especially free-flight — community both online and IRL, entertaining and educating with videos of their flock and meetups, starring the unflappable macaw Roku. Instagram’s My Flock of 11 (@fluffy.bird (IG)/Tweety and Friends (FB)) for her exemplary rehoming of birds in both New York State and online, in an environment of love, enrichment and joy; for her demonstrating the intelligence of birds to the world with Tweety, the Talking Parakeet (2014-2017); and most especially, for that generosity of spirit and grace which makes people feel at home visiting her page or account. Instagram’s @Laala_the_banana (Anika Shatara (FB)), friend to many London bird-owners, but, more importantly, self-sacrificing “Crazy Bird Lady” who gives her every extra tuppence and moment of time to protect the feral Indian ringnecks of Kensington Gardens, along with its other wild birds, from the deprivations of winter, even raising funds to provide more nutritive and beneficial fresh fruits and vegetables (To Feed the Wild Animals who Depend on Humans). Joan Rakrhra‘s Facebook group Joans North Wales Parrot Rescue, for the support, education, advise, and atmosphere of complete acceptance and love it fosters in its ever so loyal community, on the ground in Wales and further afield as more come to take part. Adventures of Roku! Congratulations, Roku and team! In 2014, Adventures of Roku established “Get Flocked,” Australia’s first IRL free-flight club, building on free-flying macaw Roku’s popularity on the Adventures of Roku YouTube channel. Adventures of Roku continues creatively to work toward a safe free-flight environment in which the right to free-fly is recognized and protected by law. In 2015, the online Adventures of Roku shop opened. The website’s education tab features a wide variety of useful articles on parrot topics important to parronts, and now separate “shop” pages exist for Australian and International purchases. Thank you, Roku, for all you have done to promote free flight and online community! CONGRATULATIONS AND THANK YOU TO EACH OF OUR PARTICIPANTS & WINNERS! We will be in touch with you to arrange for shipping of your trophy and customization of your signature BirbObserver tee-shirt. As @BirbObserver recognizes excellence in 2018 with the 1st Annual Birbie Awards, propriety dictates — and the heart cries out! — that we recognize Mitchell Knox and his unparalleled contributions to the Facebook Avian community: Mitchell Knox is the founder of the largest Facebook bird group: Macaw and Other Parrots, which currently boasts over 21,000 members worldwide. At the end of last year, after nearly six years, Mitchell, Group Admin and founder, moved onto other activities and responsibilities, passing his role as one of three Admins to Richard James Wiper, to hold down the fort along with Ambra Louvier and Carol Zelenko. However, Mitch had a strong visceral reaction to the sight of that macaw locked in the cage: Mitch began opening the cage door and letting the greenwing out to fly around the house. Soon delving into any and all available parrot books and joining the then-available Facebook groups, Mitch sought to learn all he could to best fulfill the new responsibility he had taken on with this baby macaw. Facebook groups, then as ever prone to descend to the least favorable denominator, Mitch started his own group with “a few sensible people from whom [he] could learn.” From the beginning, Mitch developed the practice of reviewing each member request and each post, anticipating that at most the group would number 50 members. With a few basic ground rules to encourage only positive interaction, the group soon blossomed due to its reputation as a fun group with a healthy learning and social environment, which Mitch’s oversight provided. At its largest, even now, the group limits itself to just three very-committed Admins. In 2016, Facebook designated Mitch a ‘Power Admin,’ and Mitch advised other groups’ Admins how better to develop and manage their groups. Our Facebook avian community has certainly benefited from Mitch’s generous contribution of his time and skills! A published author with yet much ahead of him, now that his birds are living with trusted Admin Richard Wiper, Mitch finishes off details marketing his house, writes a Musical and shakes it up with Salsa dancing. What a grace and gift — a legacy — Mitch left for the rest of us — a safe, fun environment in which to learn about macaws and share our experiences. Bravo, Mitch! Thank you! Cheerio! Beloved author of Psittaculture, Tony Silva, and long-time AFA leader Buddy Waskey hosted a tour of select South Florida aviaries in the days leading up to the Organization of Professional Aviculturists’ (OPA) annual meeting. As Florida has enacted a framework of laws favorable to aviculture, aviaries flourish there. The warm weather, though dryer than the average rain forest, sustains parrots and their kind well year-round. Florida is a haven for both the pet industry and the development of husbandry science enabling the conservation of endangered and threatened species. Florida’s “Right to Farm” Act now covers “the production of birds for the pet trade.” In effect, that means that aviculturists can readily establish aviaries on land zoned for agriculture. Florida Fish and Game alone has the right to come on such a property. On the rear of the Clinic wall above, note the posted permit. Aviary construction abounds: and the “new” style increasingly features a central aisle with flight cages extending out either side, metal nest boxes, and for smaller birds, even flight cages hung from the central structure to avoid accumulation of detritus on the legs otherwise supporting them. Tony Silva’s aviary and second farm, an aviculture academy under construction, borrow from the world’s great psittaculture practices, especially in the interweaving of practical agriculture with aviary structures. The first stop on the tour: Tony’s private aviary, an amazingly efficient ecosystem in design and practice: Tony imported trees from from around the globe to provide the fruit of the parrots’ natural diets. Importantly, parrots prefer fruits with minimal sugar: parrots navigate interspecies competition for food resources successfully as a result. The popular Western practice of feeding companion parrots highly sweet fruit only disrupts the natural equilibrium of their biological systems, exacerbating hormone swings, etc. Of all trees, the coconut palm is perhaps the most useful of all aviary trees. Parrots will shred the outer husk off unripe palm nuts as enrichment, thereby also ingesting healthy amounts of fiber. The fronds stimulate beeding — and Australian galah cockatoos will even line their nests with coconut palm leaves in lieu of their usual eucalyptus, which is not easily come by even Down Under. The verdant foliage makes for a shaded, richly oxygenated environment. I thought I had stepped into paradise when I entered the aviary. Several elements critically must be well executed: water quality, clean bowls and cages, and veterinary preparedness. A neglect of water quality risks the entire flock, as it opens the door to diseases that can rapidly spread via the cage irrigation systems. Once a watering system is installed, the lines are vulnerable to various disease agents. At Silva’s aviary the local well water is filtered, treated with ultraviolet light and also chlorine — for a minimum of two hours. The amount of chlorine added is a function of the length of the pvc 80 grey pipe: chlorine evaporates more the longer it transits the system. And as for bowl disinfection, not even chlorine is the equal of direct sunlight. The aviary maintains two quarantine rooms and two nurseries. Because macaws, like rabbits, ingest their immune system from their droppings but the droppings potentially contain microbes dangerous for other bird species, macaw chicks must be kept separately from other parrots. Lucky for Silva’s aviculturist neighbors, Silva’s state of the art clinic keeps extra units of everything to tide parrots from other aviaries over until a vet can be reached. Of course, as aviaries are in agriculturally zoned land only, a vet typically is quite far. Thus, to culture one’s own samples is critical in diagnosing and treating disease. On a nearby property, Tony Silva constructs his second type of dream aviary: an avicultural institute where students can intern for perhaps a period of six months and learn optimal practices. Below, some footage from an early morning walk through the developing site. Coral Gables, Florida — The rubicund sun lengthened the shadows as we stood on a Miami flagstone patio craning our necks, gazing awestruck at six blue and gold macaws roosting high in the tops of royal palms. Fully half of the remaining flock has showed up to be seen, as if they knew visitors were coming. They and their forebears have swooped in to this back yard every afternoon for a quarter-century — ambassadors of more than ten introduced bird species brought into the Miami area originally as pets. Over time, via escape or abandonment, some became free agents and formed flocks which have endured in some cases since the 1920s. This particular flock numbered at a high of 44 macaws at the start of the decade. It’s down to twelve now. Most of the attrition has come at human hands, the hands of what we’d usually call “poachers”. And therein lies the rub. Those who collect these magnificent creatures for sale at four-figure prices aren’t necessarily breaking the law, for these macaws are non-native species. Therefore, they are not protected as endangered species so those who shoot them down or trap them are not breaking the law and so cannot qualify as poachers. The Florida Fish and Wildlife Conservation Commission has spurned these entreaties. Its stance is that protecting the macaws would set an undesirable precedent. Next to come forward would be the reptile fanciers, then the bug lovers, and soon all of Noah’s ark would be dragged under that umbrella. The Commission insists it must hold the line against any exceptions for non-natives. Even those whose existence in the wild has become threatened or endangered. Few of us have the opportunity to see these magnificent macaws in full, free flight; we should all have that option. Their lives in an urbanized environment far removed from their natural habitat are challenging, yet they’ve prevailed. What a shame if their saga were to end at the hands of human profiteers! Anika Shatara of Facebook (@laala_the_banana (IG)) opens her palm in Kensington Gardens, and the wild green Indian ringnecks descend: they know the palm holds good food, and they are hungry indeed. These flocks of wild green Indian ringneck parakeets (Psittacula krameri) have oft caused visitors to London’s public parks wonder and surprise, the birds’ relative tameness occasioning the whipping out of phones and cameras. The ringnecks have also spread to nearby Kent and Surrey, their numbers estimated as anywhere between 17,000 and 35,000. Presumably, the birds arrived as pets, an original few purportedly gifted by India to the Royals, the majority seemingly escapees from the set of an Isleworth studio’s famous 1951 flick, The African Queen. According to Oliver Marshall, the first known successful breeding pair went down in history in 1961. Anika fell in love with these gentle, semi-tame birds on first sight. Having been involved as a volunteer at the park for several years, this winter Anika has devoted herself to keeping the Indian ringnecks and other birds of Kensington Gardens healthily fed throughout the winter. She had noticed how the young were particularly disadvantaged under winter conditions and has been particularly concerned about them. Anika is raising money on Facebook to help defray the birds’ grocery bill; Anika travels to market at least twice weekly for provisions for them. The apples can be affixed to the wrought iron fencing and provide both energy and fluids over a longer period of time than the daily feeding. You can contribute to Anika’s winter mission, To Feed the Wild Animals Who Depend on Humans. Identify each species feeding in your backyard and learn what that species needs in its diet.
. Consider providing leftovers from your meals. If you give dried fruits, keep them away from your other pets for whom they are too rich. Provide fresh water and keep it from freezing solid by putting a wooden stick or plastic ball in it. If providing a bath, line the bath with polyethylene so that the ice that has formed can easily be removed by lifting the polyethylene. Consider providing warmth by placing a candle in a tin can underneath the water source, sheltering the flame from wind with bricks, or consider using a powered radiant element like an immersion heater or a light bulb place in a tiling pipe under the water. Add absolutely no chemicals as chemicals could compromise the birds’ feathers’ ability to provide insulation. Provide only what will be eaten in one day to avoid attracting pests to your backyard. 6. Clean feeders regularly to prevent disease. Participate in a 40 year-old global activity, the worldwide Big Garden Birdwatch. Plan ahead for what you can provide in spring and summer. Mornings and evenings wild galah cockatoos congregate on the old brick streets of Sancreed Street in Burra, South Australia, by the old Police Stables and Lockup. But, as reported by ABC News Australia, on Wednesday, July 18, 2018, the urban clearing afforded a different view: lifeless galah bodies littering the ground. Mysteriously dead galah bodies. By July 23, over 236 had been counted. All in a mere fifty meter strip along Sancreed Street. The news story broke from Burra resident Ruth Norris‘s July 20 Facebook post on “dead and dying galah.” A University of New England Animal Care and Rescue officer, Ms. Norris received two calls July 19 reporting galahs that were “not doing well.” Phone calls from the Burra area began to pour in: dead galahs on Sancreed Street. Ms. Norris warned area residents not to allow dogs or cats to ingest any dead galahs on the ground. Goyder’s Regional Council collected and removed the corpses from the public space. At the time of Ms. Norris’ posting, the dead galahs in that small area numbered 115. Within five days, the number increased to 236. Several hours north of Adelaide, Burra features “an outstanding collection of 19th century civic, residential, church and Cornish mining structures, all located around” the Burra Monster mine. Built in the Old Colonial Regency style, the courthouse and police lock-up “‘An Historic Copper Town and the Merino Capital of the World,” present-day Burra is a 1940’s consolidation of five copper mine company towns, of which Kooninga, serving the Monster mine, was the largest. Copper, along with sheep and wheat, sustained the young South Australian economy: South Australia only became a British colony in 1838. At the height of the Monster mine’s production in 1859, Kooninga bragged a boom population of over 1,500 inhabitants. Today, however, Burra’s population maintains a steady approximate 1,000 residents, and the town proudly touts its National Heritage listing. Built largely in the Old Colonial Regency style, central Burra’s government buildings, like the Old Stables and Police Lock-Up sported stone masonry fronts along with the more usual iron-bark wattle and daub of the era. Imported iron roofing replaced the thatching, of early settlement. Sancreed Street, by the old Police Station, lies at the heart of the preserved town district. Further out, the residences featured brick fronts and the usual imported corrugated iron rooftops of the period. As Ms. Norris clarified, all of the galah corpses dropped along a 50 meter stretch of Sancreed Street. Necropsy determined that all of the dead galahs were mature, disease-free and uncontaminated by any of the many toxins for which the cockatoos had been tested. Although it was winter Downunder and not “carting” time — when threshed grain arrives in town for transport elsewhere, which can lead to some accumulation of grain in the street — the cockatoos exhibited grain-filled crops. Yet area farmers had reported that, when sick, the galahs had not acted “grain drunk” as they may at carting. Given the galahs’ full crops, by inferrence, the galahs ingested grain which had been either intentionally or accidentally tainted with an unidentified but lethal substance. November 5, 2018, the Mount Barker District Council issued a “scaring” notice for Little Corellas, following their April 3, 2018 decision endorsing “selective legal shooting” of flock leaders, or “scout” corellas. The measures seek to discourage flocks, especially the largest flock, from summering in the area. Longer term the Council is undertaking habitat modifications like altering lake banks, in-planting beneath eucalyptus trees, and altering creek shorelines to make it harder for birds to access the standing water, and so discourage flocking. Mount Barker, South Australia, just 21 miles from Adelaide’s city centre, is not the only local council to have taken action. In February, the Playford Council launched a campaign to remove the flocks of Little Corella “plaguing” the community. The Playford News reported that local complaints included that the “large and noisy flocks” damage trees, town squares, recreations areas, buildings and other infrastructure. “Infrastructure” is not a particularly clear term. Suffice it to say, the birds are known to cause damage to electrical wires. According to Mayor Glenn Docherty, as reported by Playford News, the birds caused significant damage and escalating clean-up costs. Playford allegedly took action against the Little Corella having “been advised by bird-strike experts that recent weather patterns have created an abundant food supply for Corella to flock to Adelaide and its outlying regions.” Further, the Little Corella have lost some of their traditional range due to increased urbanization. In short, the City of Playford understood that without intervention, the Corella could potentially remain for months, rather than the usual several weeks, breeding rather than flying off to their traditional breeding ground. Little Corellas, Cacatua sanguinea, also known as the bare-eyed cockatoo, blue-eyed cockatoo, or short-billed corella, is a smaller cockatoo native to Australia and New Guinea. Little Corellas weigh in at just over one pound, being about 15 inches/40 centimeters in length. Long-billed Corellas (see below right), unlike Little Corellas, are protected under South Australian law. However, they may flock with Little Corellas. Thus, care must be taken in flock management of Little Corellas, that the measures not adversely impact protected birds. Shooting must be undertaken with caution, as the authority to kill a protected species is only granted by permit. Initially Playford contracted to disperse flocks from known roosting, flocking and feeding sites with “bird-scaring devices and pyrotechnics.” In June, when damages had reached over $60,000, Playford changed tactics. Mayor Docherty indicated that fear-tactics had backfired– the Little Corella had started to associate large noises with fertile feeding grounds. So the City mobilized its two falcons, Ziggy and Lucy. City of Playford’s falcon Ziggy has only to rest on a pole, and already, in the background, flock members rise in flight from the open field. After African greys were designated endangered, the Asian price remained largely unchanged: prices provided informally by some South African breeders indicate the price when designated as threatened was approximately $300/hand-fed aviary grey and $400-500/pair wild-source grey. and when designated endangered about $300-500/wild-sourced bird, with hand-fed aviary greys unavailable due to a dearth of export permits. In short, the up-listing throttled aviary-bred supply, drove market-share expansion of the illegal trade, and so increased incentives for black-market wild-sourced birds. The True Green Alliance reported that, of the conference’s 35,000 attendees, approximately 66% were non-voting observers, who had paid for the privilege of presence to lobby voting parties. IFAW, the International Federation for Animal Welfare, one of the world’s largest animal rights organizations, sent 38 representatives: animal rights activists, who oppose pet markets and aviaries in principle, appeared in force at CoP17. As reported by World Parrot Trust, implementation of the African grey up-listing occured January 2, 2017. The anti-pet and anti-aviary animal rights impact on the outcome at CoP17 should not be ignored. An online petition from World Parrot Trust (WPT), mobilized popular opinion in Europe and the US in favor of Proposal 19, the proposed up-listing. The regulatory restrictions imposed by the Appendix II threatened listing in 2012 had hardly had time to achieve compliance, yet Proposal 19 argued that the system was unequal to ensuring the grey’s survival. However, regulatory ineffectiveness is not a recognized grounds for up-listing within CITES. Nor does political science support dismissing the effectiveness of a regulatory program which has hardly had the time to be implemented much less have fully developed enforcement policies and practices and so stabilized. It’s patently unreasonable to expect such magical results, especially when considering that implementation had to occur in underdeveloped economies with substandard technologies and communication systems. Furthermore, those citing such grounds in support of Appendix I listing failed to demonstrate why compliance issues could not be addressed on a state-by-state basis geared toward solving problems on the ground, rather than impose yet another new regulatory regimen for implementation on a global scale. That would seem to penalize those that did comply. The Dodo article includes photos and video footage from a WCS parrot rehabilitation facility in the DRC subsequent to the up-listing, when poaching incentives reached their height. The images haunt with the damage wrought on these amazing creatures. We applaud Wildlife Conservation Society‘s (WCS) and other similar organizations’ rehabilitation efforts, but note that had the petition accurately accounted for the legitimate role of aviaries in supplying domestic markets, the need for such intervention never would have been so great. Likely, the naively trusting public would not have signed petitions designed to put legitimate suppliers out of business and increase black-market incentives. The need for the valuable work of these organizations continues, by virtue of their hand in creating the current desperate situation. The 2018 fire season’s explosive Carr and Mendocino Complex (California) conflagrations – among many others – illustrate the damage wildfires do to human infrastructure as well as fire’s effects on birds, other animals, and their habitat. This article is third in a natural-disaster series that’s already looked at the effects on birds from earthquakes and from volcanic eruptions. Both short- and long-term effects must be considered. In the short term, somewhat surprisingly, studies show that immediate avian mortality in wildfires is normally low. Stills and video of this season’s fires make it hard to imagine any possibility of escape, but birds can outfly even these flames. When significant mortality occurs, it’s almost always due to smoke inhalation in thick smoke that obscures vision and renders escape more problematic. Birds’ airways are damaged by smoke in the same ways humans’ are; severe or prolonged exposure can cause death, and birds who recover from lesser exposures can still end up with chronic breathing problems. Nonetheless, most birds survive the immediate fire. But when a fire burns 350,000 acres (nearly 1,000 square miles!) in a matter of days, as the Mendocino Complex fire has done, what becomes of the habitat and the birds that relied on it for food and shelter? Here we discover an interesting difference between the effects of massive eruptions and huge wildfires. Such eruptions create a central “kill radius” inside which essentially nothing survives. Even intense wildfires, by contrast, “hopscotch” and leave numerous untouched pockets of vegetation where recolonization can begin almost immediately. Even the burned out sections can support returning bird life relatively early on. Again unlike eruptions with their all-devouring surges of incandescent ash, wildfires leave behind partially carbonized branches and trunks. Those rapidly become both food source and ”condo complex” for wood-boring beetles and their larvae. These delectable grubs attract woodpeckers in particular. The new clearings created in the burned-over areas become swarming grounds for all sorts of aerial bugs – and feeding grounds for flycatchers, bluebirds and the like. Birds that nest in clearings but feed in the surrounding untouched patches also find new homes with little ado. Birds themselves play a significant part in the land’s re-greening after wildfires. They eat seed-containing berries and fruits, and in the process of digesting the tasty part, their acidic juices weaken the seed coats and facilitate easier germination. The birds fly hither and thither, excreting as they go, thereby assuring a wide distribution of now-ready-to-sprout seeds complete with a starting dose of guano fertilizer. Another aspect of wildfires is their natural place in the ecosystem. We now understand how fire plays a key part in germination of seeds in species such as lodgepole pines, jack pines, banksia and eucalyptus. In some species heat is necessary to melt the resinous coating surrounding their seeds; in others, remarkably, chemical “indicators” in the smoke itself will trigger the seeds’ germination process. This allows repopulation by the original flora. The endangered Kirtland’s warbler, as one example, benefits from this cycle: It feeds only on young jack pines that sprout from the ashes of their parent trees. Until recent years forest managers didn’t recognize the importance of regular, smaller fires that thin the undergrowth and burn accumulating deadwood. Our Forest Service worked hard for decades to suppress any and all fires; the result has been fewer, but more intense and damaging blazes that destroy these seeds rather than triggering germination. And on the front doorstep of climate change, even the “fewer” term in that equation is now called into question. Proper forest management is a key to restoring and preserving the equilibrium that we ourselves tipped into imbalance. In doing this, we also help to assure the longer-term stability of that ecosystem as well as its bird and other animal populations. Prairies too, like temperate and boreal forests, rely on fire to consume weeds, shrubs and dry brush, allowing native prairie flora more “elbowroom” and access to light. Birds such as the lesser prairie chicken and the horned lark thrive on recently-burned prairie. Fire in a tropical forest is a different matter. The soil in most such forests is relatively thin and rainfall tends to be high. Exposing this soil to the elements as the result of fire often causes it to wash away and erode, or in other cases “laterize” (turn quickly to hardpan). In either case the forest will regenerate poorly, the habitat will be sparse and food will be scarce. Too many of these fires are started by humans eager to clear land for grazing or agriculture and failing to recognize the irreversible damage they’re setting in motion. To boot, the same natural processes quickly render the newly cleared land unsuitable for man’s intended use. Many species of tropical-forest-dwelling birds have already had their numbers depleted by loss of habitat and, in species such as psittacines popular with bird fanciers, by excessive wild harvesting (or outright poaching, in many cases). An ever-diminishing range exerts severe pressure on populations. The additional insult of a tropical forest fire and its aftermath can force such species to the brink of extinction. A discussion of birds and wildfires would be remiss not to mention the issue of whether several Australian raptor species (locally and colloquially called “firehawk raptors”) actually take advantage of fires deliberately to secure prey. The black kite (Milvus migrans), whistling kite (Haliastur sphenurus), and brown falcon (Falco berigora) have all been fingered as suspected arsonists. No, they don’t rub branches together or strike steel to flint. They accomplish this by congregating at an existing fire, seizing burning branches in their beaks, carrying them for up to a kilometer and dropping them into unburned areas to spread the flames. The resulting blaze drives rodents and other prey ahead of it, allowing the waiting raptors to pick them off easily. But though Aboriginal oral history abounds with tales of these firebirds, and more than a dozen modern-day sightings of this behavior are recorded, skeptics still point to a lack of photographic evidence. And even were such evidence forthcoming, the question of intentionality will continue to be debated hotly. To sum up, birds affected by wildfires will suffer significant short-term disruption typically followed by recolonization, quickly in some areas and more slowly in others. The existing equilibrium is knocked off balance and “oscillates” for a time, with old species declining or being supplanted by new immigrants, followed by a gradual return to near steady state. Birds themselves play a part in the regrowth of burned areas by bringing insect infestation under control and by spreading seeds already encased in natural “fertilizer”. And there are those controversial accounts of a handful of Promethean raptor species snatching up blazing brands and firebombing the outback — using fire as a tool to roust prey and drive it towards their drooling beaks. While individual species may not fare well in some instances, birds overall continue to demonstrate their resilience to wildfires much as they do to other large-scale natural events that humans call “catastrophes”. Indeed, some may even make good advantage of them. Falconry, an ancient cultural heritage arising around 2,000 BC in Mongolia or Central Asia, is alive and well in the Mideast. In fact, mid Eastern nations predominate in the United Nations listing of Falconry as Intangible Cultural Heritage. Mid Eastern falconry made BBC news reports today as more evidence from a 2015 terrorist kidnapping incident came to light. In 2015, a group of 28 Qatari citizens, Royal family members among them, traveled with their falcons to southern Iraq, where, reportedly, favorite prey of the Sakara falcon — the Houbara bustard– then abounded. Alarmingly, terrorists invaded the Qatari camp and held the group hostage eighteen months, allegedly until ransom was paid. Sheikh Muhammed bin Abdulrahman al-Thani, newly appointed foreign minister, received a list of hostages taken and immediately recognized the names of two Royal family relatives. It fell to the new Qatari emissary to Iraq, Zayed al-Kayareen to handle the tense negotiations. Meanwhile, the kidnappers stowed the Royal family members in a windowless prison cell, providing minimal sustenance. When the men emerged some sixteen months later, they had lost approximately 50% of their body weight. Variously identified as ISIS, and Hezbollah, ultimately the kidnappers appear to have demanded payment to Kataib Hezbollah (a shiite group supported by Iran). The ransom demands varied over time. Allegedly $1 billion was demanded and paid, yet whether the money remains in the coffers of Iraq’s Central Bank or did in fact make its way to Kataib Hezbollah remains unclear. What is clear is that neighboring states Saudi Arabia, the United Arab Emirates, Bahrain and Egypt had previously blockaded Qatar precisely on suspicion the country provided funding to terrorists. And if ransom was delivered by Qatari jet illegally over neighboring airspace, more than falcon feathers are ruffled. Volcanic eruptions predate life on earth, and volcanic eruptions can harm or kill wildlife locally and sometimes even globally. Yet life evolved, and has persisted despite such catastrophes. Birds are affected as other animals are: by the explosions themselves, the pyroclastic flows that follow them, the suffocating ash and gases, the loss of food sources and habitat to lava flows and ashfall, the disruption of usual migratory routes. In extreme cases, volcanic cataclysms can threaten species worldwide when ash is ejected high into the stratosphere, where it circles the earth and blocks sunlight, causing “years without a summer” and perilous crop failures. Yet birds may enjoy advantages that other animals may not share. In particular, except for flightless birds, their superior mobility in three dimensions may enable them to escape more quickly, find more secure refuge, and eventually resettle their old nesting or feeding grounds before other animals when food and shelter return. The ongoing eruption of Kilauea Volcano in Hawaii recently entered a new phase that threatens bird life in a broad swath of the “Big Island” of Hawaii’s Puna district. Before diving into today’s headlines, let’s first look at several historic eruptions for which the effects on birds have been studied and documented. Jehol Biota fossils: Massive volcanic eruptions 125 million years ago in what is now Liaonang, China created white-hot pyroclastic (pulverized molten rock) surges that snuffed all life in their path. Numerous fossils, remarkably similar to fossilized remains from Pompeii, resulted. Among these are many different species of birds, caught “frozen” at the moment of death by superheated clouds of ash that preserved them where and how they fell. Vesuvius: One of history’s most famous eruptions in 79 CE buried Pompeii and Herculaneum under meters of burning ash and wiped out all life on the upper slopes of the mountain. This eruption caught up domestic birds as well; archaeologists have unearthed not just fossils, but cages, perches, coops and cotes both inside and adjacent to dwellings. Today Vesuvius is a national park, teeming with wildlife including over 100 species of birds — resident, migrant, wintering and breeding types all being well represented. Mt. St. Helens: The most violent continental US eruption in historic times occurred in 1980. All birds in the 230-square-mile blast / debris avalanche zone died. Many escaped the mudflows and ashfall that created a lunar surface across many more square miles. Nevertheless, birds were flying back into the blast area within days. Old habitats had been destroyed, but new ones had been created that could provide homes for bird species different than those that had predominated. The forest birds were gone, but ground-dwellers found niches in which to nest, and within a few short seasons the land was revegetating. As these new habitats grew increasingly complex, they were colonized by a strikingly diverse array of bird species. La Soufriere volcano devastated half of Montserrat Island. Creative Commons. Soufriere: A series of Pelean eruptions caused widespread devastation on the Lesser Antilles island of Montserrat between 1995 and 2010. Following each of these explosive eruptions, all forest avian populations declined but rebounded rapidly over the subsequent two to three years. No species were extirpated; all have recovered to their pre-eruption numbers and several ground-foraging species are considerably more abundant. A number of these species are designated “range-restricted species”, endangered due to decreasing habitat, but none of these have experienced population declines. And lastly Kilauea, Hawaii: Its current eruption began in 1983 (the author was hiking on Kilauea that day) and has persisted almost without pause since then. Its first two years were characterized by periodic high fountaining and short lava flows. The effects were felt only in a small radius of perhaps a mile. Then prolific lava flows began to be produced, and this has continued through today. Several communities and many tens of square miles of Hawaii Volcanoes National Park were covered by these flows over the years. Most of this land was already barren, old lava flows with scant vegetation, occupied only by a few Hawaiian owls and traversed by foraging birds. In 2008 a lava lake formed at the summit of Kilauea and persisted until three months ago. It emitted thousands of tons of sulfur dioxide and other noxious gases daily, and these gases mixed with water droplets in the air to create “vog” (volcanic smog). Fortunately the land downwind is barren, but wind shifts periodically affected breeding colonies of nēnē (native Hawaiian geese, an endangered species being cared for in the Park). Aggressive human intervention prevented significant harm to these colonies. In mid-May new vents opened in populated and forested land near the coast far from the summit. These vents have been spewing lava and large quantities of gases continuously ever since. Lava claimed more than 600 homes in a single searing night and has gobbled up thirteen square miles of tropical green. Lava is entering the ocean on a four-mile-wide front and has created a square mile of new land. Sulfur dioxide has killed or seriously damaged many additional square miles of forest and crops. In the meantime the summit crater has commenced a slow collapse, interspersed every couple of days with large steam and ash explosions when rockfalls block the crater throat and bottle up the pressure until it “pops”. This new eruptive phase has therefore caused significant loss of local avian habitat, sparing neither land, air nor water birds. Despite little evidence of outright eruption-caused mortality, bird populations have largely fled the affected areas when given that option. Newly lava-inundated land will offer scanty habitat for decades to come. One particular area has fared especially poorly. The Malama Ki Forest Reserve, a little downslope from the eruption, was invaded by — and partway covered with — lava. The Malama Ki reserve had been set aside as one of the last native habitats of several species of Hawaiian birds, above all the ‘io – Hawaii’s only native raptor, listed for many years as an endangered species. ‘Io will nest only in the specific type of forest found in the reserve, but nearly half of this reserve is now yards deep in hardened lava, scattered with ash-white trunks of incinerated hundred-foot trees. The eruption’s environmental degradation jeopardizes the continuing survival of a unique ‘io sub-population notwithstanding its unusually high resistance to many avian diseases, which makes this threatened diminution of biodiversity tragic. According to Dept. of Land & Natural Resources Hawaii island manager Steve Bergfeld, these birds “may no longer persist, may rapidly decline, or become further fragmented and/or contract in range.” The jury remains out on the fate of these scarce ‘io. Most volcanic eruptions that cause a large loss of animal life are of the explosively short-lived type: Vesuvius, Tambora, Krakatoa, Pelée, St. Helens, Soufriere, and Pinatubo, for example. Kilauea’s eruption is now 35 years old, having largely maintained a nonexplosive steady-state, thus offering insight into both short- and long-term effects on various avian populations. Fossil and historical records show the first type of eruption causes immediate and severe harm to bird populations, but also that birds resettle opportunistically once sustainable habitat becomes available. The overall population rebounds, but some species may not return and new ones may populate entirely new types of habitat. Hawaii presents a different challenge with its threatened native bird species and recent change in eruptive behavior. Kilauea’s long, less violent eruption has had more subtle effects and fewer acute crises (until now) allowing us sufficient time to mitigate its impact on Hawaiian birds, particularly endangered species. It is to be hoped that Tutu Pele – loved, respected and feared Hawaiian volcano goddess — will now take pity on her remaining hawk and duck populations and spare them any further in-person visits.